The six-month-old liberation struggle in Libya entered a crucial phase with the rebels taking control of capital Tripoli. This more or less portends the end of the Gaddafi regime, which has been ruling the country for the past 42 years. However, at the time of writing this, there is no word about the whereabouts of Col. Moammer Gaddafi — who has not been seen in public for more than two months. There are unconfirmed reports that his sons have been captured by the rebels. Gaddafi, whom the US calls a “tyrant” and a “dictator”, is wanted by the International Criminal Court (ICC), as are his son Saif al-Islam and Gaddafi’s intelligence chief Abdullah al-Senussi. In June, the ICC had issued warrants against the three on charges of crimes against humanity after the UN Security Council referred the Libyan situation to the ICC in February. 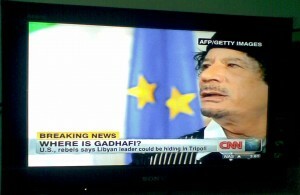 However, the journey from here will not be easy for the Libyan rebels. With the country’s innumerable tribes and clans (close to 140) gearing up to stake a claim in the power pie, it needs to be seen where Libya goes from here.